I actually have a love and hate relationship with Asian Pay TV Trust (“APTT”). For those of you who have been with this business before its maiden spin off from the Macquire Infrastructure Fund days, you will know that this has long been a cash cow that has over the years been delivering and bringing in lots of cash for the unit holders as well as the banks which provided the financial leverages via borrowings. I have made close to 46% return from capital gain and dividends back in 2012. But have since lost most of it after accumulating new units from the spin off. Its IPO price debuted at S$0.97. I even accumulated more units when its price drop after IPO. But eventually, I was forced to cut loss and sell off at various prices ranging from S$0.60 to S$0.80 due to the worsening cashflow position and declining earnings with the exception of 20,000 units. I figured out that as long as the business does not collapsed within 10 years, the high dividend yield will still compensate for any further decline in unit price and also to retain the opportunity to participate in any business development upsides in future. Ok, enough said, let’s go back to do some financial assessment based on the latest published 2017 Annual Report. TBC first large cable TV Operator in Taiwan to complete the digitalization of its subscriber base and switch off analogue TV broadcasting in 2017. Management of APTT did mention that for 2018, they will be offering discount TV packages to grab market shares as well as to continue to build on the business strategy of up-sell and cross sell of services across Taiwan Broadband Communication’s (“TBC”) subscriber base to drive growth in future cash flows. Management has re-affirmed in February 2018 that the distribution guidance remains at 6.5cents per unit for the year ending 31 December 2018, unchanged from 2017, subject to no material changes in planning assumptions. 1 1. Can the dividend going forward be maintained? 2. What are the risks associated with holding units in this Business Trust? Is it not a stable business that will continue to generate stable cashflow for unit holders? 3. Is the current price of S$0.510 (after the plunge over last 2 weeks) the right time to go in? Will it go down even further? Key Financial Concepts- Why APTT management keep using EBITDA instead of Net Income when reporting on its financial performance? EBITDA refers to the Earning Before Interest, Tax, Depreciation and Amortisation. The cash generation prowess is what APTT business represents due to the nature of its business. Taxation refers to corporate taxation as well as the accounting concept of deferred taxation which is a very abstract concept. I do agree that taxation is irrelevant in measuring the performance of the management. 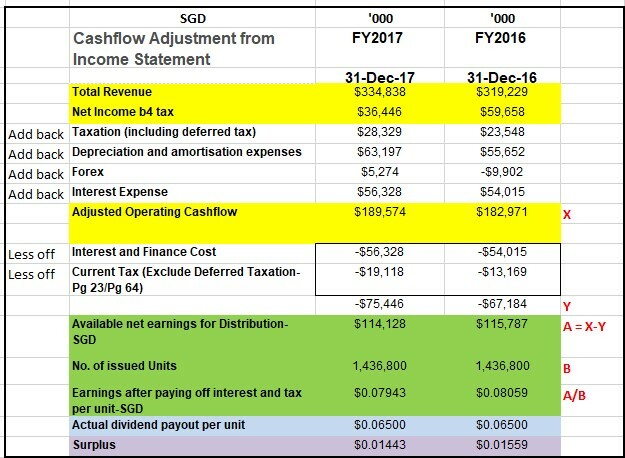 Hence when the Taiwanese government announced that going forward, they are going to increase Corporate Tax Rate from 17% to 20%, the EBITA if ceteris paribus, will mean that nothing in terms of the business has changed fundamentally albeit the drop in distributable free cash flow. Interest refers to financing cost of borrowings. This is arguably not within the management control as rates can fluctuate even if the borrowing quantum remain the same. However, there is still a cashflow impact for this item similar to Corporate Taxation. Depreciation and Amortisation represents cash paid up-front for acquisition of Property, Plant and Equipment and Intangible assets. Intangible assets here refer to Cable TV Licenses, Software, Programming rights and goodwill from acquisition of an acquiree’s business. Out of S$2,391Mil, Cable TV licenses to operate in Taiwan from government forms the bulk of this item with value of S$2,372 Mil. Interesting thing is that this license does not have any expiry hence the cost will never be amortized as it grants APTT perpetual rights to be in the business in Taiwan. Rest of the items such as Programming rights will be amortized according to their useful lives. There is no cashflow impact from effect of depreciation and amortization. 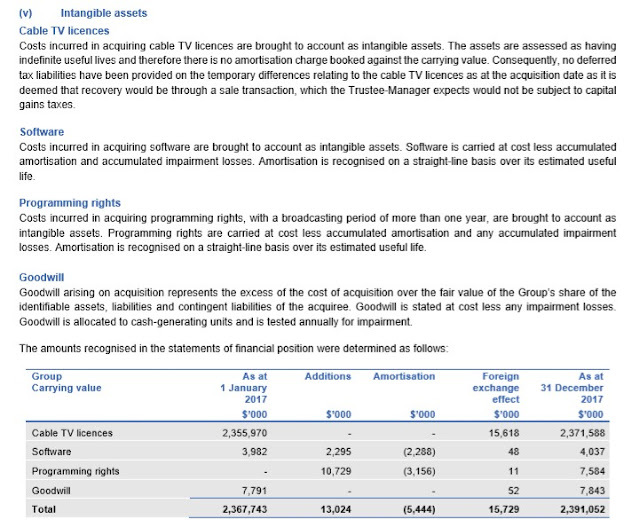 A key point to take note of over here is that the management team is relying heavily on bank borrowings to finance any major CAPEX such as the rolling out of digital TV broadcast. Since equipment do get worn out eventually, there should by right, be cash set aside yearly for future CAPEX. Hence a significant problem resulted from the current business operations is that it will run out of cash at one point in time when such need arises. A business cannot be borrowing indefinitely and then just keep paying financing cost. This unplanned CAPEX depending on its urgency and also quantum will eat into the distributable free cashflow or even worse, it can lead to rights issue if the quantum is significant. The second point is that the management team has always been using leverage on bank loans to pay out high dividends to unit holders. Also, the banks do not grant indefinite borrowing. Business is all about sentiment. If market condition worsen, there is risk that APTT cannot get the S$1.4 billion of onshore loan facility renewed. Good thing is that APTT had concluded a re-financing agreement with its banker in October 2016 which extend the loan facility for 7 years expiring on 26 October 2023. But do take note that the loan taken from this facility needs to be repaid in various tranches over the years and not just at the end of the facility term. There is still another S$125Mil offshore multi-currency term loan facility due in 2019. However, APTT as of 31 December 2017 only have S$80 Mil of cash and trade receivables. 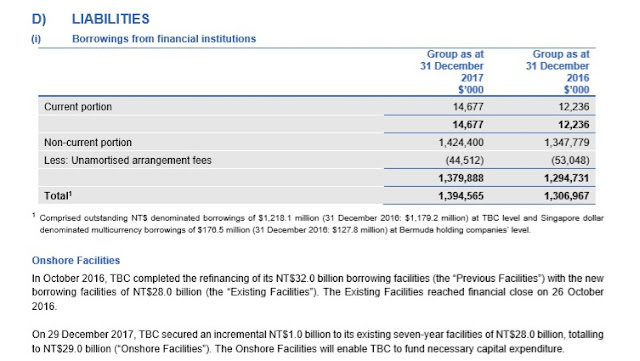 Since it paid out most of its free cashflow as dividends, it will run the risk of default should the bank decided not to renew this facility. Even if it does not pay out any dividend for 2018 and reserve the cash for the off shore loan repayment, this may still not be adequate in view of uncertainty over the ability to sustain the current level of cashflow in view of competition. Of course, APTT can still tap on its other onshore loan facility to draw down more cash to tide them over but you folks get the gist of what I am saying here: APTT is running heavily on leverages for its survival. It has a very weak statement of financial position in terms of actual cash on hand. But it does have cashflow to pay out dividends if management is successful in the execution of the strategy to at least stabilize the current level of earnings coupled with the assumption that there are no future change in Macroeconomics conditions that will force bankers to withdraw and stop debt renewal. Although past financial performance does not equate to future performance, it does give us some insights into the state of the Paid TV business in Taiwan. Note that Net Income has been decreasing over the past 5 years. This is a worrisome trend. Is the dividend sustainable? Earnings per share significantly less than the dividend per share declared. Hence to look just at the net earnings per unit, many analysts concluded that the dividends are not sustainable. This is not true unless there are drastic changes to the way APTT operates through the financing leverage model or the business conditions worsen as per mentioned above. I view the APTT business as a high risk model with high leverage. In addition, there is market disruption arising from the popularity of illegal android TV boxes, legal content provider Netflix, Viu etc. I do like the high dividend yield based on the current unit price for compensation of high risk undertaken by investor to provide equity funding. There is no net tangible asset value left from the statement of financial position in the APTT business. The guide to its perceived survival depends on the outlook of its future cash generation ability. Since investment is also about capital preservation, in the absence of earnings upgrade visibility, I will not suggest anyone putting all their eggs in one basket. The high dividend yield is really to cater for the high risk premium for this business. Probably, investors should make it just a small percentage of one's overall stock portfolio until things become clearer that the business strategies can bear fruits for FY2018.